When you can do (almost) anything you want every day, what do you spend your time doing? For me, the answer is reading. From a young age, my mom read us books like Little House on the Praire, A Wrinkle in Time, Redwall, and Narnia. But reading as an adult is hard; before cruising, my favorite books tended to be business related: Good to Great, The Checklist Manifesto, and Outliers. Now that we cruise, reading is my biggest hobby. This year I’ve also toed the water into being a novelist. Writing something other than a travel and sailing blog or articles for Cruising World magazine has been eye-opening. I hope that someday I’ll finish one of the various novels I’ve started and publish it. Maybe, if you like contemporary romance, you’ll be interested in reading my novels. In the meantime, I’ll keep polishing off books like there’s no end in sight (because there isn’t). 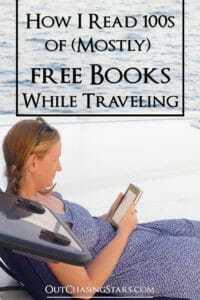 This is my number one source for free books, and usually the best method for getting to read free best seller books. Before we left to go cruising, we went to the library to renew our memberships. Overdrive lets you create a wish list and place holds on books that are popular. You can check out up to fifteen books at a time, and each book can be checked out for fourteen days. When your loan expires, the book will not be removed from your Kindle until you connect it to the internet. Sometimes I can be strategic and hold on to a book longer than fourteen days, but sometimes I end up scrambling to finish a book before I can connect to the internet and download my newest loan. David and I have an Amazon Prime membership, and with that comes the Amazon Prime Reading program where you can borrow up to ten books at a time. There is some overlap between Amazon Prime Reading and Kindle Unlimited. Also, I find the program difficult to browse and find books I’m interested in, so I haven’t used this source much. The Amazon Prime membership is $99 a year. Last year I took a hiatus from all other book options and signed up for Kindle Unlimited. The first month was free, and the second month was $9.99. Most of the books are independent authors, romance, and some of them were just not great. But, if you’ve got a strong commitment to powering through books, you can find some gems. Since I canceled my subscription, I’ve found more books in the Kindle Unlimited program that I want to read, which I have saved in an Amazon wish list for the next time I decide to spend $9.99 on a book binge. For Prime Members only, Amazon offers you a choice of one of six books every month, curated by an Amazon editor. On Prime Day, all the Amazon First Reads for the month were free, so instead of one book for that month, it was six! Book Bub is another great source for independent authors and their free books. Book Bub is a curated list of sales on books – some of them a reduction in price or some of them dropped all the way down to free. 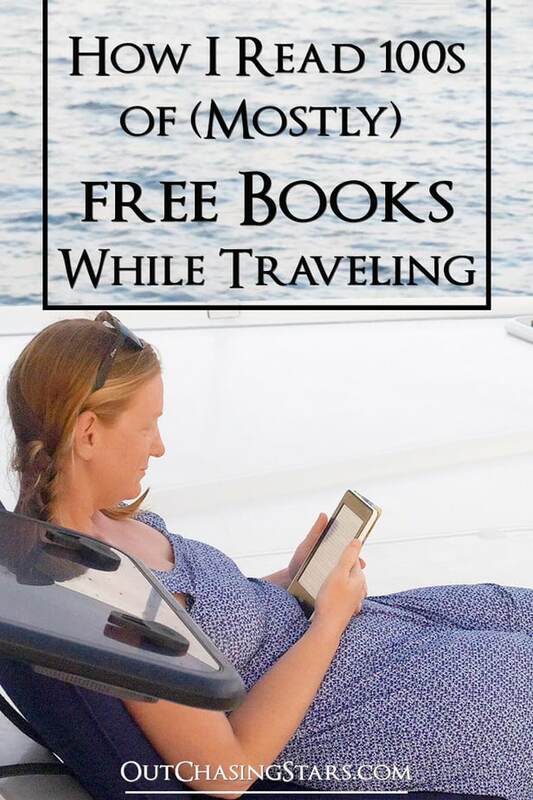 We often swap books with cruisers or raid a book swap at the nearby marinas or hotels. I don’t really like to use physical books anymore (I’m out of room on the bookshelf), so when I do pick up a book somewhere like a book exchange I always make sure I read one of my hardcopy books first and contribute it. There’s also a file swap with fellow cruisers option. I have thousands of books available (some in the public domain) for me to read on my Kindle. I use a program called Calibre to organize these files and browse my digital library. Often, some of the books I get for free I really enjoy, and that can lead me down a rabbit hole. Sometimes I want to buy the rest of the series**, sometimes I want to read everything else the author has written. Rarely ever do I just shop and buy a random book; I have enough to read without spending money on books. (This is why an Amazon gift card is always the best gift for me…there’s always a book I want to read that I can’t get elsewhere). Young Adult: Angst, romance, and LGBTQ are all highlights for me in this genre. Fantasy: Fantasy has been one of my favorite genres for as long as I’ve been reading ever since Mom read Narnia to us when we were kids. Now I fancy more complex characters, side stories of romance, and political intrigue. Having a Kindle on a boat is a no-brainer to me. I’m able to have a library of thousands of books at my whim, plus millions in reach when I have an internet connection, despite my Kindle weighing no more than 205 g.
My Kindle does not have access to cellular service. It’s a Paperwhite, so it’s got no apps, games, or notifications. My Kindle is no more than a book when I’m reading. I’ve tried reading hard copy books with a red headlamp at night, and I get a headache. My iPad screen is too bright even when it’s on night mode. I have trouble with glare on my iPad screen while in bright sunlight. Basically, I would be miserable cruising without my Kindle. It’s even got a fancy colorful case! I spent $150 on books this past year, plus add in our $99 prime membership and the one month I bought of Kindle Unlimited at $9.99. That averages to a dollar a book! Thanks to my friends Mary Grace and Madeline, who asked about my reading choices and encouraged me to write about reading, even though I thought no one would be interested. Want to keep up with what I’m currently reading, and what my favorite books are? Check out my Goodreads profile. *I’ve counted up 263. Some sources are hard to count, as they mostly show up in my Amazon purchases list and I may or may not have read them yet. **I’m learning from the sales side of being an author that this is a great tactic. If I get the first book in a series for free and like it, I’m more than happy to buy the rest and support an author I like. Very clever. ***John Green and his brother, Hank Green, are responsible for a majority of my entertainment between all of John’s books, their podcast Dear Hank and John, and their vlog vlogbrothers. DFTBA. Wow, you are a big reader! I’ve been tracking how many books I read on Goodreads this year and I’m only at 74 🙂 Very cool that you want to write romance. People can do very well in that genre. Thanks Ellen! I’ve been enjoying reading your blog regarding the publishing process! I am usually sea kayaking when in holiday, often doing multi day trips carrying camping kit. My book reading time at night with a kindle is as much a part of the holiday as the kayaking. I love those nights snuggled in the tent with nothing else to do but read, usually with some chocolate and a flask of mint tea to hand. My favorite part of being a mother was reading to you guys! I even turned it into a career!